This April has felt like Summer, Spring, and Fall are all duking it out for weather supremacy. One of the great joys of going to the movies however has always been the joy of 72 degrees no matter what month it is. This week, we have a new independent film to entertain you as well as the continuation of our hugely popular $2 Tuesday series. Read on for more details. 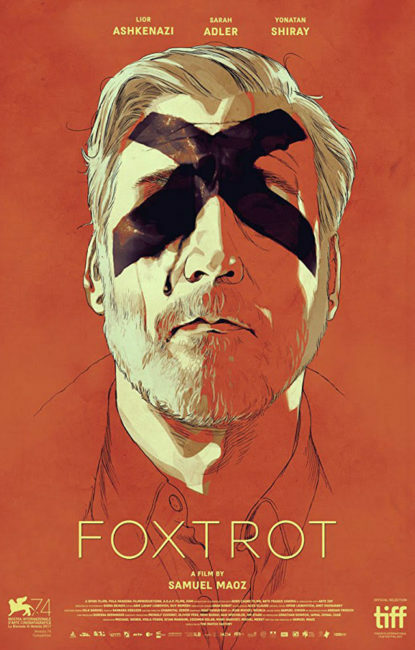 FOXTROT comes to us from Israeli filmmaker Samuel Maoz, whose previous film Lebanon was one of the most acclaimed films of 2009. This new film takes us into a world of grief and war with spellbinding visuals and a strength of vision that you won’t find in many filmmakers. Israel’s entry in the race for best foreign language film, this movie is finally making its way to New Orleans and we hope you take the time to experience it. ISLE OF DOGS, THE DEATH OF STALIN, TYLER PERRY’S ACRIMONY, and A QUIET PLACE all stay in our lineup for another week. Due to much interest, we are showing A QUIET PLACE with open captions this Thursday at 5:20 PM. This screening will feature all the spoken dialogue on screen for those who may have hearing difficulty. We hope to do more screenings like this in the future. COMING TO AMERICA was this week’s $2 Tuesday selection. After spending two months in Wakanda, we spent a night in Zamunda with a vintage Eddie Murphy classic. McDowell’s sandwiches were not provided. Next week takes us on a trip to New Orleans with DOWN BY LAW. This Thursday brings DISTANT SKY – Nick Cave & The Bad Seeds Live In Copenhagen. Featuring the iconic musician playing tracks from his catalog as well as his newest album, this will not be a concert to miss. We still have a limited number of tickets so grab them while you can. BYOB(aby) will be showing ISLE OF DOGS this week. This infant-friendly show will be on Thursday at 11 AM and will feature sushi from Asuka available for pre-order on our website. With the lights turned up and the sound turned down it is a perfect way to bring your baby to the cinema in a stress-free environment.